We’d love your help. Let us know what’s wrong with this preview of Lee Brilleaux by Zoë Howe. 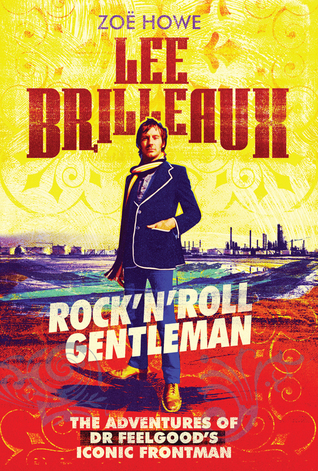 To ask other readers questions about Lee Brilleaux, please sign up. I love Howe's books, I really do. I feel like they kind of immerse you in the appropriate era, set the scene, whether it's gentlemanly dress or outright anarchy (I'm looking at her Jesus and Mary Chain book, here). And I like that. When it comes to music, so few can do that this well; there's often a leaning of being the fan against presenting an honest and full picture. See I knew about Lee Brilleaux, I knew about Dr Feelgood, but in the grand scheme of classics, and those who died before their time, he's been outshone by many in that respect and I'd never delved into his full story. From his childhood and forming the band, to their heyday, the vast line-up changes and feuds, this just puts you right there. Zoe paints the most vivid of pictures of everyone, sets the scene well, and writes so well. I did not get teary eyed at the last line, I swear. The point is I'm kind of glad this was my full introduction to the ins and outs of Lee, because it's been told exceedingly well, and it hooks you in. A fine biography of one of the UK's greatest vocalists, Zoë Howe paints an evocative portrait of Lee Brilleaux. It's particularly helpful for the post-Wilko period as the growing Feelgoods legend is so dominated by that iconic line-up. And that Wilko and Lee weren't able to meet before his death is one of the great rock'n'roll tragedies. A well researched book. Enjoyable from start to finish,giving an insight to one of Britain's greatest rhythm & blues exponents. as a massive Feelgood fan from 73 onwards this is the book I have been waiting for , It bookends Looking back at me ,Zoe,s Wilko bio so well and is a more rounded story perhaps in a way because Lee died over 20 years ago so Zoe,s research and interviews had to glean the facts from friends and archive material rather than interviewing the subject. That Lee passed the same time as another perhaps more famous rock icon in Kurt Cobain has always meant that from his time of passing his life and story as a massive Feelgood fan from 73 onwards this is the book I have been waiting for , It bookends Looking back at me ,Zoe,s Wilko bio so well and is a more rounded story perhaps in a way because Lee died over 20 years ago so Zoe,s research and interviews had to glean the facts from friends and archive material rather than interviewing the subject. That Lee passed the same time as another perhaps more famous rock icon in Kurt Cobain has always meant that from his time of passing his life and story slipped undeservedly under the radar . Zoe puts that right here by putting you right back in the zone , from his adolescence on Canvey and the bonds and friendships that lasted all his life , right through to the halcyon days of Doctor Feelgood in the mid to late days of the 70,s and the split from Wilko and then the further line ups until Lee was the only original member left .This marked the time when he perhaps became a more rounded character although he never lost his drive and his mojo of entertaining his audience right to the very end . Outside of the band you learn of his bonhomie, his gastronomic prowess and love of the finer things in life which unless you were a dedicated fan you would be unaware of , but which go to make this Biography so much more than the usual cut and paste of incessant reviews and soundbites . It truly does the subject justice and is one that all Lee,s family and friends and legions of fans can be proud of . My only regret is that I can only award it 5 stars , for me it,s a 10/10 a joy and one I will return to again and again. I discovered Dr Feelgood in retrospect, with my initial contact the single She's a Wind-up. That same year I stumbled across Wilko Johnson on the Hope and Anchor album, made the Dr Feelgood connection and went looking for the early Feelgood albums. Lee Brilleaux, as even Wilko has said, was Dr Feelgood. A man with amazing stage presence and this fine biography tells you all about the main man.